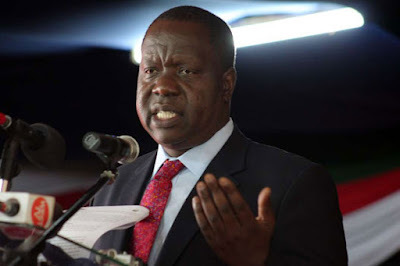 Mr Matiang’i said the results show a normal curve as reforms in the exam system are entrenched. President Kenyatta directed CS Matiang'i to institutionalise reforms so that the achievements made in the last few years are maintained. Teachers’ unions on Wednesday dismissed this year’s Kenya Certificate of Secondary Education examination results as a fraud that had condemned students to mass failure. Kenya National Union of Teachers (Knut) and Kenya Union of Post-Primary Education Teachers (Kuppet), which were sidelined by Education Cabinet Secretary Fred Matiang’i during the release of the results at Nairobi School, called for a total overhaul of the grading system. Kuppet Secretary-General Akelo Misori termed the results the most irregular and disastrous in the Kenyan examinations history. “We cannot hurry to release results without a proper audit and celebrate mass failure of students. The exam results have been released when other papers are still being marked,” Mr Misori alleged. He said Dr Matiang’i hurriedly released the results in order to be seen to be working. His Knut counterpart Wilson Sossion said the government was talking about a 100 per cent transition from primary to secondary and wondered why it was limiting transition from secondary to university. “There seems to be a deliberate effort to force more students to join tertiary institutions,” Mr Sossion, who asked where more than 300,000 students who did not qualify for university will go, said. “Reduction in the number of students joining universities is an indicator of disaster. Something is wrong, and that is why he (Matiang’i) does not want unions at all. "Transition to universities should be improving, it is genocide for our children,” he said. The release of the results caught many unaware as county directors and some heads of schools thought they had been invited for an ordinary meeting at Jogoo House. “We are meeting the CS but we are not sure of the agenda,” a principal who spoke to the Daily Nation said. The principals were then informed of change of venue and they had to rush to Nairobi School with some arriving late. Before the release of the results, President Uhuru Kenyatta was briefed by Dr Matiang’i and his team. President Kenyatta directed the minister and the head of Knec, Prof George Magoha, to institutionalise the reforms so that the achievements made in the last few years are maintained. The President also asked TSC to reward principals, schools and subject teachers who excelled to ensure continued high performance. But similarly, he said, teachers caught helping students to cheat should be punished severely. President Kenyatta also directed Dr Matiang’i to work with Attorney-General Githu Muigai to make presentations to the DPP so that cases of cheating involving more than 700 teachers countrywide are expedited.